The degree offered is the Bachelor of Arts with a major in African, African American, and Diaspora Studies, and a concentration in either African Studies or African American and Diaspora Studies. The Department also offers a minor in African Studies and a minor in African American and Diaspora Studies. Additionally, the Department offers language instruction in Swahili, Wolof, and Lingala. Prospective majors should contact the Department’s Director of Undergraduate Studies, Dr. Kenneth Janken. Students with an overall grade point average of 3.3 or higher at the beginning of their senior year, and who have already completed AAAD 395, are encouraged to apply for candidacy for the B.A. with Honors. Students interested in undertaking honors research and the writing of a thesis should consult with the Department’s Honors Coordinator no later than their junior year to discuss the process of applying to the program. 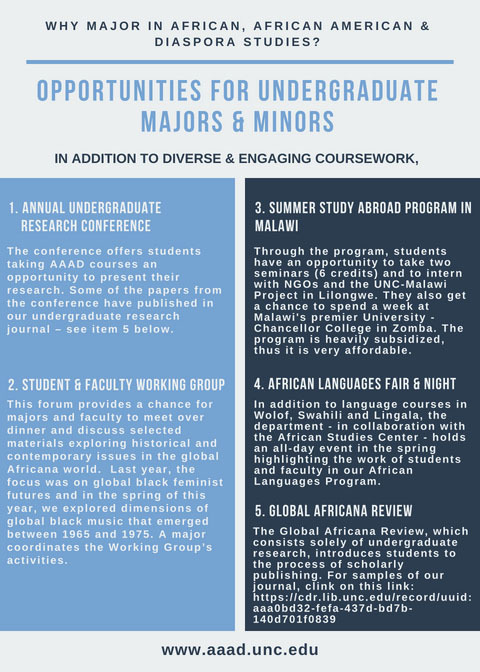 Upon declaring the major in African, African American, and Diaspora Studies, students should consult with the Director of Undergraduate Studies, who is also available to students at other times in their academic career. The full requirements for the major and minor are published in the Undergraduate Bulletin/2018-2019 Catalog.